早上二点在家我做完工作了 / homework finished at 2:00a.m. 冬天已经来了. / Winter has come. George, don't bother me, please! FACS, please help me out! 夜景很漂亮。 It allays my fatigue. Below is an excerpt from my notes to answer his question. If you're interested, click "変形生成文法によると," but please be noted that 8 years have passed since I graduated from university. My memory is fading. There might be some inaccurate description. It's Nov 30. Dec starts tomorrow. It was just before noon. I was working in the office. Got a call from the personnel dept. Since I’m currently transferred to a different workplace, I sometimes receive notices directly from the personnel dept now. I thought today’s call is one of those occasional notices about something. “Yes,” said I, being a little bit puzzled, because I’ve never got a call from the personnel dept just because they’ve got the result of the exam I sat for. Did I hear that right!? “What’s my exact score, then?” I asked. So, it’s no mistake. 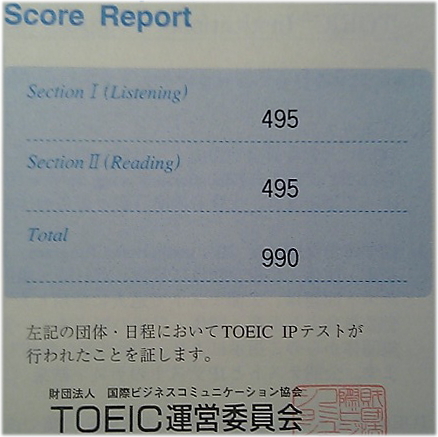 Finally, I got a perfect score in TOEIC. 非常高兴! I’ve never stayed in any other country but Japan. So, I’m proud of the result for my background. How could I? It could partly be accounted for by the fact that I’ve been keeping English diary here in my blog. And, you know, TOEIC is such a unique and tricky exam. Three days before the exam, therefore, I crammed, actually. Following are those books that I referred to. They were helpful. I recommend them. : You can test your own lexicon with this. :You can tell your weak points with this. I tried this book, which “diagnosed” me as being weak in Part4 and Part5 of TOEIC, so I browsed (but didn’t buy) some books on TOEIC listening technique at Kinokuniya right before the exam. And it worked! Now I have only to work hard for USCPA! Today the lesson was about the basic word order of Chinese. e.g. Why don't we meet at the park at 2:00 p.m. tomorrow? (1) 我们 (2)明天下午两点 (3)在公园 (4)见面， 怎么样? This Chinese NHK program is a big help for me. Without that program, such a beginner like me had no chance to get started learning Chinese. Eigo-de-shabera-naito (night), which you can view on channel 2 (NHK) right after that Chinese NHK program, is also one of the intersting programs that shed light on a cross-cultural theme. After all, some NHK programs are really educational. I really like them. NHK, however, has been criticized for its corruption these days, and I think there's no good excuse for them. I'm such an honest and naive guy that I pay the viewing fee for NHK and I often doubt if I have to pay for that when I hear that not many people pay for it. NHK, don't let us down any more! 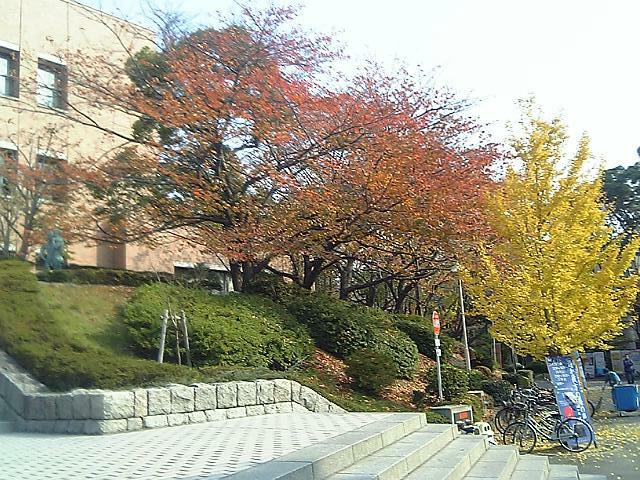 ↑今天我在关西大学参加汉语考试。(Today I sat for a Chinese Exam at Kansai Univ. I haven't visited a place like a university premise for a long time. So I got a bit nostalgic feeling. Though the testing time is one hour, I, as well as other candidates in the classroom, finished in half an hour. Anyway, it’s over now. The result of the exam is supposed to be informed in a month. It was really kind of you to give me a lot of (even enormous) help about my Chinese study. I don't know how to express my gratitude! Now, all the enthusiasm of mine shall focus on USCPA exam! At this moment of time, K.T san, whose everyday activity that has been reported on his blog really inspires me, is now sitting for the USCPA exam in Hawaii. He's almost putting an end to his long journey of USCPA study. Let's get started with another challenge !! I still have some trouble in listening comprehenstion. It cannot be helped now. I'll go over the words that I memorized again. Whether or not I can make it tomorrow, anyway I'll be back to USCPA study tomorrow. haolan-san and asset-zxd-san provides me with a lot of info about Chinese language. Following is a feedback of a part of those lecture notes. The memo above is modified by me, nn, so that I can deepen my understanding. Therefore, all the possible misstatements, if any, are of my responsibility. This BECAUSE clause is very important in English grammar because that why-because logical structure is the very base of their conception framework. And I think it also counts a lot when I learn other foreign languages, including Chinese, because, when I talk to people with different cultural & linguistic backgrounds, we can easily get into a trap of misunderstanding. So I should always be careful to explain the WHY when I communicate things in a different language. Today, I had dinner with M san, whom I met by chance the other day. Since we parted in no time at that time, we arranged to meet again to exchange the latest news about ourselves. It was not just another nomikai, but it was rather a kind of job training. I had a lot to learn from what he told me. He didn't put those lessons in such a explicit way like a homily. But I noticed a lot of important things in his words. So, although I drank like a fish (I was excited anyway, because I met a guy I respect & admire most in my life as a business person!) and intoxicated, I opened my little notebook on the train on my way home, and wrote down what I learned from his words tonight. Why? See my log on the 3MB data of Nov 18. From tomorrow I shall concentrate on my Chinese exam! You know, it's, of course, for applying for USCPA exam (考试). On my way to a post office (邮局), I had a second thought. "It's so expensive. If there's any blind spot in my plan, the loss is huge." Then I called a personnel dept. of my company if I can take a day off adding to the Golden Week. 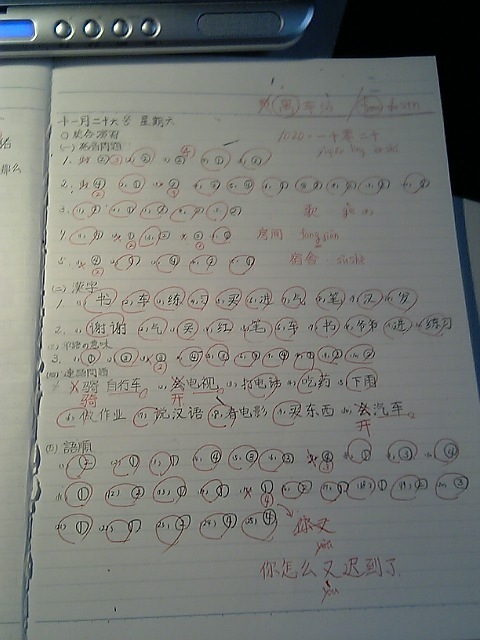 The answer was negative, which means I have to take all the four subjects during the Golden Week, including the days required for transportation. Next I called Anjo to ask if the Hawaii test center is open Saturday and Sunday. The staff over the phone said it is closed on Wednesday and Saturday. Besides, many candidates sit for the exam on Golden Week, so it's hard to find a seat during the period, and flight charge is all the more expensive because Golden Week is a hot period for those who enjoy their vacation abroad. The other day I had Anjo confirmed that FACＳ sent my academic evaluation to Delaware states. And I had Anjo send the transcript of the credits that I earned in Montana State Univ. So I have only to send the application form with USD692-money order to Delaware. I'll mail it on December 5th. Then the application will arrive in Delaware by mid December, by which time the transcript and FACS evaluation should have arrived there. So my application will be accepted by the end of Dec, which is the due of the special treatment for the issuance of the certificate of USCPA in Delaware. After all I gained 2 more months for prep. I'll never let this chance just lip by me. 2 months. It's a gift. Well, from now on, I won't use so much time for blog-keeping, though I keep on leaving a short comment everyday. I'll do whatever it takes to realize the above promise!! I got started since this April. I'm going to sit for the Chinese Exam on this Sunday! I have a great teacher and friend. We got to see each other on a USCPA related blog. She's very kind, and often teach me Chinese on the Web. She's very good at teaching. Ｉ think she's great. China and Japan have some problems between them on a Governmental diplomatic basis. I SINCERELY hope they can work it out!! I shall never forget the war-time history, especialy that with China and US. I like China and US very much, so I'm working hard to learn their languages! I hope someday we all can make things right with each other.